Unified Service Desk enables you to use the rich knowledge base in Dynamics 365 or Parature (depending on the knowledge source configured in Dynamics 365) from within the agent desktop so that your customer service agents can quickly search for relevant knowledge while working on a case, and provide accurate answers to the customers, without having to switch applications. When you deploy the Knowledge Management sample application, and search for a case in Unified Service Desk, the new KM Control hosted control is automatically displayed in the right panel of the agent desktop application in a case session. 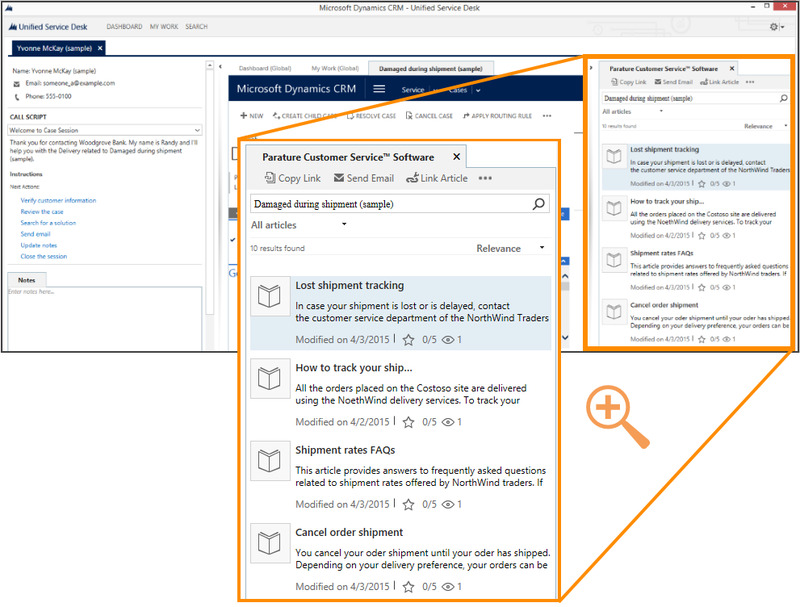 Search the knowledge base: Your service agents can search and view knowledge base articles in Dynamics 365 or Parature from within the agent desktop. You can configure the knowledge base search control to automatically show search results based on the title of the currently opened case or based on any other criteria as soon as a session is created. The service agents can also manually search for knowledge bases by typing in the search phrase in the search box. Position your search control as required: You can configure where you want to display the knowledge base search control in your agent desktop: the left panel, the main panel, or the right panel. In the Knowledge Management sample application, the control is placed in the right panel. For information about different types of panels, see Panels, panel types, and panel layouts in Unified Service Desk. Copy the link or URL of the article. You can paste the article URL in the chat session with customers or in an email. You can only copy URLs for articles that aren’t in the draft or expired state. Send the knowledge base article link in an email. 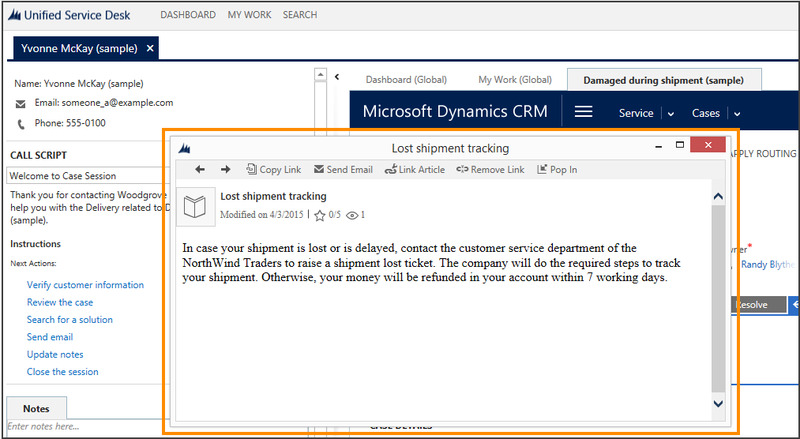 Associate a knowledge base article with an incident (case) in Dynamics 365. Associating articles to cases helps to determine which articles were effective in resolving cases. You can also configure to dissociate a knowledge base article from a case if the article isn’t helpful or is out-of-date. Click a knowledge base article in the search panel to open it in a tab in the main panel with all the contextual actions available. Links in a knowledge base article can be accessed to navigate to the linked topic from within Unified Service Desk. Pop out and pop in a knowledge base article on the Unified Service Desk main panel. This feature is useful if you’re working on multiple monitors, and want to pop a knowledge base article out from the client and display it on another monitor while you continue to work with the customer on the Unified Service Desk client on the current monitor. After finishing your work, you can pop the article back in on the main panel. For information about how you can configure knowledge management integration in Unified Service Desk, see Configure Unified Service Desk to use Dynamics 365 or Parature knowledge and Walkthrough 8: Use Parature knowledge base within your agent application.